The southern prickly ash (Zanthoxylum clava-herculis) and the eastern prickly ash (Z. americanum) are relatives of the Sichuan hot pepper (Z. simulans, Z. bungeanum). This is a spice, by the way, that is safe for people with nightshade allergies, who shouldn’t consume cayenne or other hot peppers which are in the nightshade family (the Solanaceae). The prickly ashes are members of the Rutaceae – the rue or citrus family. That’s right, they’re related to oranges and lemons! Strongly diffusive, prickly ash stimulates the movement of fluid and heat in the body. It directs blood to move from the core of the body to the tissues at the periphery. Prickly ash is an excellent remedy for stagnant conditions, whether they’re chronic (like edema and fluid bloating) or acute (our friend Sam Coffman recommends prickly ash tincture in cases of hypothermia – stagnation with cold). This herb is a good rubefacient – an herb which brings blood to the area when applied topically. It’s helpful when dealing with bruising, damaged tissue due to injury, sprains, strains, and illnesses involving fluid stagnation, including arthritis. It’s the bark we work with, as decoction, poultice, or tincture. Combining it with ginger, cayenne, or other heating, motivating herbs like them is a way to enhance these effects. But! 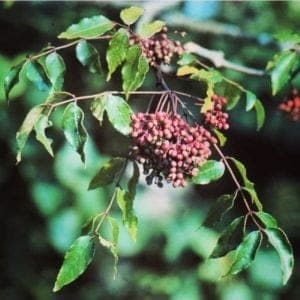 Prickly ash, and all blood or lymph-moving herbs, for that matter, work BEST when they’re combined with BODY MOVEMENT. So this week, as we look at our Herb of the Week from a number of different perspectives, we’re also going to look at some movements which will complement its activity. To begin, let’s start simple – with a nice quick walk. Simply step out your front door and walk for 5 minutes in any direction, then turn around and walk home. Easy as that! Walking engages all of your major muscle groups and is an excellent way to get your fluids moving again. In fact, if I had to choose, I’d say the walk was even more important than the prickly ash! Fortunately, you don’t have to choose just one – you can have both. Go ahead – this will still be here when you get back. Spicy, tingly prickly ash isn’t just stimulating to blood movement in the body. It also causes an increase in salivation – the fancy herbal action term for this is ‘sialagogue’ – which, believe it or not, can be an important medicine. Generating and moving fluid in the mouth breaks up stagnation, and improves tooth and gum health. Many pharmaceuticals induce dry mouth as a side effect, and we’ve had good results with occasional use of prickly ash tincture to counteract this problem. The “toothache plant” spilanthes (Acmella oleracea) has similar effects, and is perhaps even better-known as a remedy for dental pains. The two of them together are a powerful pair! Let’s try a couple movement for better oral health! First, take a sip of water (or tea) and swallow. Now, try moving your jaw through its full range of motion: make chewing motions, push the lower jaw outwards and inwards, circle it around horizontally like a cow chewing its cud, open wide and stretch out in all directions. Move the tongue around, too – touch every tooth on each of its surfaces, curl it in and out, stick it out and wiggle it around a bit (don’t worry, no one’s watching). This may all seem a bit silly, but one of the most important things we can learn about movement is that SMALL MUSCLES MATTER. If you’ve been dealing with TMJ (temporomandibular joint dysfunction), you might have gotten the impression that there’s nothing you can do but take painkillers or wear a bite guard at night – but exercises can help. It’s been shown that simple mouth exercises are more effective than splinting (immobilization) of the jaw. Plus, lots of TMJ comes from neck and shoulder stiffness, so try some gentle neck stretches too – and hey, a bit of prickly ash applied topically will get the blood flowing and loosen up those joints, too! Prickly ash (Zanthoxylum spp.) is what we call a nervous trophorestorative. That’s a way of saying it restores health and functionality to the nerves. The major way it accomplishes this is, once again, by improving blood flow, particularly in the tiny capillaries that deliver fresh blood to other all the tissues of the body. Improved micro-circulation of blood improves the health of the nerve tissues themselves, allowing better transduction of electrical signals. This in turn restores feeling where it’s been lost – as in neuropathy – but it can also relieve pain, as the nerves stop sending distress calls up to the spine and brain. Prickly ash thus helps resolve nerve pain, numbness or tingling, loss of sensation in the hands and feet, and similar issues that have nerve damage or loss of function at their root. For these purposes, it’s useful to combine prickly ash with damiana, st. john’s wort, or evening primrose, and to work over the long term. And of course, keep your body moving too! Did you know you can stretch not just your muscles, but your nerves too? Here’s a simple one to try: stand with your arms out to each side, like a kid playing Airplane. Then lift your hands so the fingers point to the sky. Now, push outward through the base of the palms while simultaneously extending your fingers as far as you can, as if you’re trying to point them back toward your head. Spread your fingers wide while you do this. You should feel a sensation (some might say “pain”) along the bottom edge of your arm, from armpit to wrist. That’s your nerve stretching! From that stretched position, you can make little circles with your palms, rotate the arms in different directions, try figure-8s or infinity-symbols – try a bunch of different patterns to see what feels best. There are a number of different “neural glides” or nerve stretches like this you can test out – do some exploring and see what you can find! 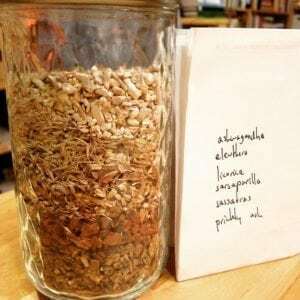 The microcirculatory stimulation effect of prickly ash is a useful catalyst in liver and kidney support formulae, such as a rootbeerish adaptogen / hepatic/renal alterative blend like this one: ashwagandha, eleuthero, licorice, sarsaparilla, sassafras, prickly ash. Adjust proportions to taste and need. A bit of ginger isn’t remiss; we don’t have dry ginger at the moment, so we’ll cut a bit of fresh each time we make a pot. If you can get your hands on fresh wintergreen, definitely add a few leaves – I’ll bring this to our little patch of forest next time we go, we have plenty growing there. 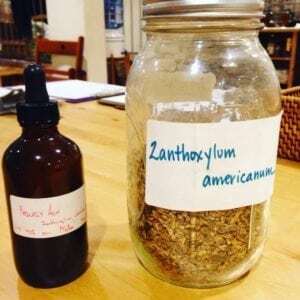 Echinacea could be added to this blend to further enhance defensive response as an adjunct in cases of envenomation (bite or sting from a venomous insect, spider, or snake – more on this below). Part of the reason I wanted to prepare this was because of the half-dozen wasp stings I received last time we went out to our woods! As for movement musings: So, it’s good to be able to sprint. You can actually get away from wasps if you clear enough distance – 20 yards or more – fast enough (and aren’t anaphylactically allergic). One way I like to do a sprint workout is to go to the park, and stand by a tree on one of the long sides of the field. That’s now the origin point. Then pick out two trees at different points on the other long side of the field, and sprint to each one four times. Between sprints, walk back to the origin point. Don’t forget to warm up first, and cool down after! Prickly ash creates a strong tingling sensation in the mouth due to the alkamides (such as herculin), a constituent type which you can also feel in echinacea tinctures. These are known to interact with the human endocannabinoid system, binding to the CB2 receptor. They also speak directly to its dispersive effect: when you taste that tingle, you know the herb you’ve got there is increasing circulation and movement in the body. Prickly ash and echinacea are related in another way: though Echinacea is probably the primary plant to work with for serious venomous bites*, prickly ash is definitely worth including as a part of a formula – again, both internal & external. It helps with immune response, pain management, and recovery from the wound. 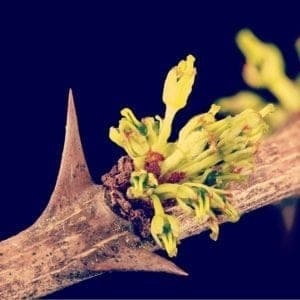 Aside from bites, prickly ash is a decent antimicrobial – it bears a bit of berberine and other alkaloids with known antimicrobial effect. Its tannins give it astringency which is palpable to the taste, which tends to translate into independent microbe-inhibiting action. Again, though, it’s most effective against infections and for wound-healing when it’s part of a formula: perhaps together with barberry, garlic, elecampane, or wormwood. 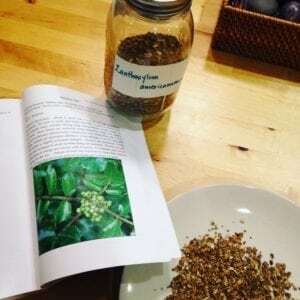 PS: We have a full video + text herbal monograph on prickly ash (and 86 other herbs) in our Materia Medica course, which you can take stand-alone or as a component of our Herbalism 101 program.